The 25th National Sports Collectors Convention kicked off Wednesday afternoon, July 21st, at the I-X Center in Cleveland, OH with a special VIP Party from 2:30-5:00 PM and then the first-ever National Sneak Peek from 5:00-9:00 PM. Beginning at 2:30 PM, VIP attendees headed into the NAXCOM VIP Lounge where you had the opportunity to sign up for an online NAXCOM account and then spin a wheel to receive free cash to fund your account. The cash prizes ranged from $5 up to $100. I was one of several lucky spinners who landed on the small, yellow sliver for a $100 cash prize. The VIP Party was also the first opportunity to receive the VIP gift bags which contain numerous National-exclusive and rare promo cards from Donruss/Playoff, eTopps, Fleer, Press Pass, Upper Deck and more. A steady flow of free pizza and drinks from Pizza Hut and Pepsi was available throughout the party. 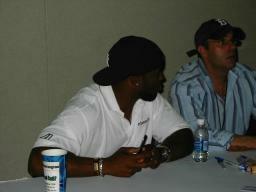 At one point during the afternoon, the 2003 first-overall NFL draft pick, Cincinnati Bengals QB Carson Palmer, who was at the party signing autographs, also stood in line to take advantage of the free pizza and drinks. 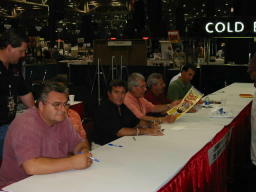 Several exclusive autograph guests not available at any other time during the National were available for reduced-rate signings during the party. These exclusive guests included the previously mentioned Palmer, who was making his first-ever show appearance, Green Bay Packers RB Ahman Green (see image to the right) and NBA pioneer Spencer Haywood, also making his first-ever show appearance. 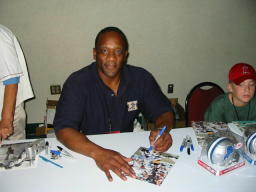 In addition to reduced rates on these autograph guests, VIP attendees were able to receive free autographs from five of the exclusive VIP guests in attendance including Heisman Trophy Winner Billy Sims (see image below), TV's Dennis the Menace, Jay North plus All-Pro linebacker Vaughan Johnson (see image below), NHL star Ken Sabourin and TV's Timmy from the Lassie show, Jon Provost. I want to say a special thanks from myself and dozens of other VIP attendees to Sabourin, Johnson and Sims who continued to sign past the scheduled time so that everyone who had stood in line could get an autograph without having to move to the Autograph Pavilion. 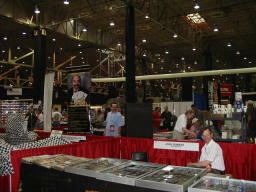 At 5:00 PM, as the VIP Party came to a close, the 25th National Sneak Peek opened and all attendees were free to visit the National floor for the first time and the hundreds of booths it holds (see images below). In addition, attendees were offered the chance to get autographs from the Wednesday exclusive signers including Hall of Famer Whitey Ford along with Palmer, Green and Haywood who had moved from the VIP Party to the Autograph Pavilion. 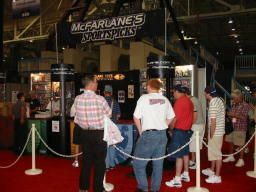 One of the most popular booths throughout the entire evening of the National Sneak Peek was the one from McFarlane Toys as collectors stood in line (see image below) to make certain they were able to get the exclusive National figures which had been limited to a first-day purchase of four sets per person. The first National figure is a twist on their original LeBron James figure which shows James in his NBA series 5 pose and dressed in his all-white Cleveland uniform. The other exclusive National figure is a different look at an Allen Iverson figure which shows Iverson in his NBA series 6 pose featuring a jersey never offered before; the 76ers' blue alternate uniform. 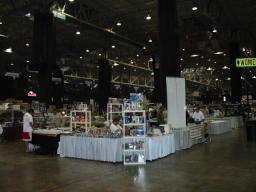 The figures, priced at $15 each or $25 for both, are extremely limited and considered to be highly collectible. Then at 7:30 PM, Johnny Maestro and the Brooklyn Bridge, the Doo-Wop legend that recorded such hits as "Sixteen Candles," "Step by Step," "The Angels Listened In" and "The Worst That Could Happen," entertained Sneak Peek attendees with a rare live performance, courtesy of Donruss/Playoff. Prior to the performance, group members took part in an autograph session where each member would add their signature to posters that could be purchased for $5 (see image below). As the sounds of Johnny Maestro and the Brooklyn Bridge began to fade and time ran out on the first-ever National Sneak Peak, you would have to look back on the VIP Party and opening of the 25th National as an indicator that Cleveland will once again be remembered as a great host. 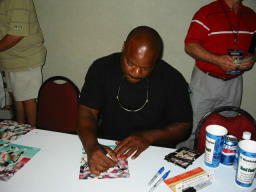 Bob Williams is the owner of TradingCardCentral.com, the one stop site for sports and non-sports trading card enthusiasts. 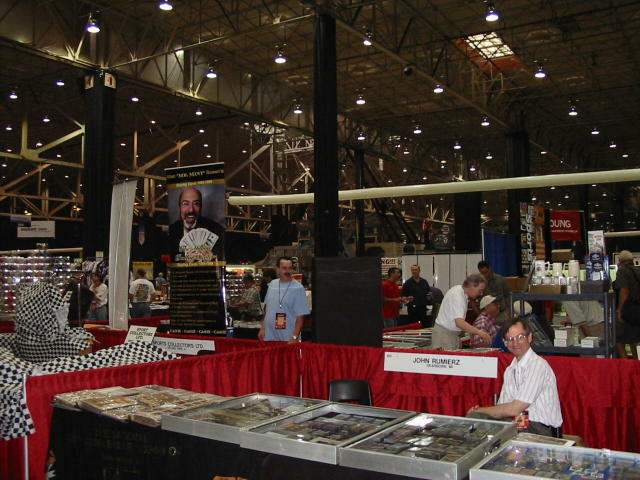 He has been collecting sports, non-sports and gaming cards for over 20 years and has a personal collection of over 0.5 million items.